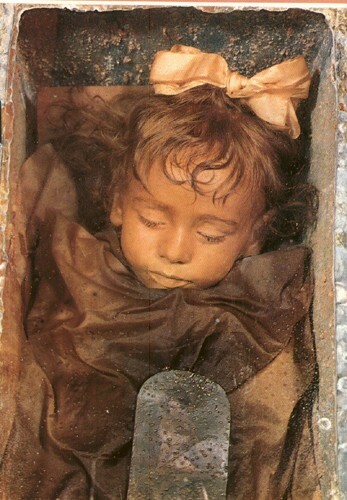 This 2 year old girl called Rosalia, known as “the sleeping beauty”, is the world’s best preserved mummy. Incredibly, she was embalmed in the 1920s and, unlike Egyptian mummies, even her organs are intact. Rosalia is on display in the Catacombs of the Capuchins in Palermo, on the Island of Sicily. For the past 400 years the monks here have been preserving the local dead and putting them on display. 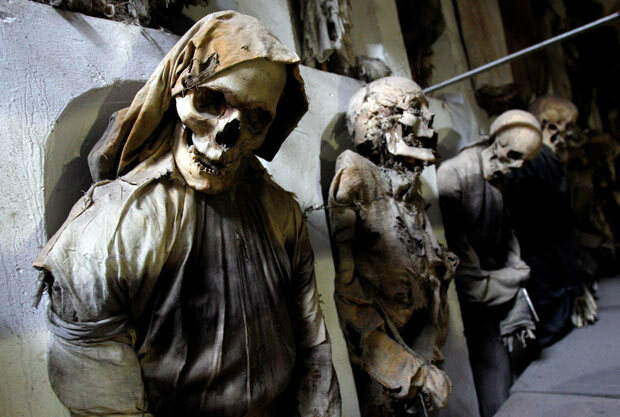 The catacombs are open to the public and visitors can gaze at at over 1500 bodies. All categorized according to their gender and status. 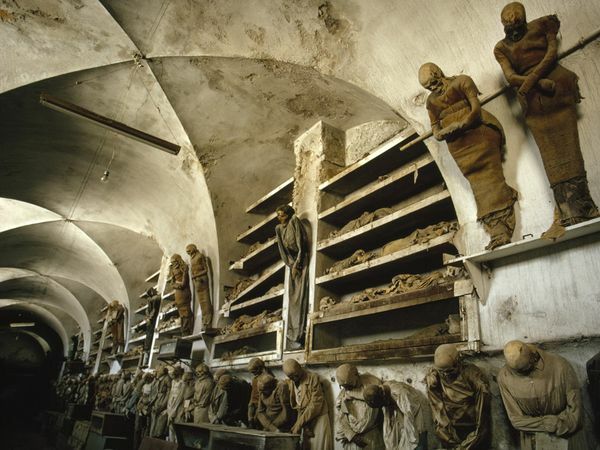 Despite being hundreds of years old the bodies are remarkably well preserved – you can still see their skin, and their clothes haven’t rotted away. This underground vault houses the largest collection of mummies in the world. Dr Dario says it all started in 1599. When friars found well preserved bodies in a grave next to the monastery. 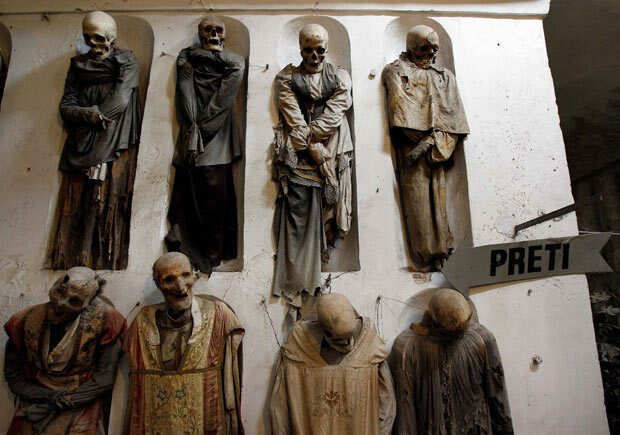 These early corpses were remarkably well preserved because of the dry and cold environment the friars found them in. These are ideal conditions for a process known as spontaneous mummification- which occurs when natural processes of decomposition come to a halt. Realising this, the friars began applying this process to fresh corpses. “Basically the bodies were laid in some preparation rooms where there was a grid made of terracotta pipes and the body fluids were draining away, then the environment was doing the rest,” says Dr Dario. But not all the mummies here have been created naturally by a cool dry environment. The Friars wanted to improve the process and so, like the Ancient Egyptians, they started treating the newly dead using chemicals. Rosalia was painstakingly mummified by a local doctor Alfredo Salafia who pioneered new methods of embalming by experimenting on unclaimed corpses in the island’s morgues. Dr Dario and his team worked hard to establish exactly what Salafia’s method was by analysing minute samples of Rosilia’s skin. Formaldehyde dehydrates the body and hardens the tissues. To counteract this Salafia’s formula mixed it with a cocktail of other chemicals – including glycerine and alcohol. It’s a formula still used by embalmers today. “Salafia wants to give you the impression they’re still alive and they’re only sleeping ..if you look at the eyes, the hair, everything suggests that she’s still with us … The other mummies are different … they look dead,” says Dr Dario. Dario’s mission in life now is to preserve all the mummies here for future generations. For him, there’s nothing creepy about them at all, least of all Rosalia, who he first saw when he was 21 years old. That is down right creepy. I personally believe in cremation and think people who believe in burials and mummifications are a bit off to say the least. Ashes to ashes, dust to dust. Mummification is desecration and disrespectful to a body.